Links Posted in a users news feed have a 0.14% CTR, 1 Click Per 715 impressions according to an analytics study conducted by EdgeRankChecker.com. A brief summary of this ranking data: if you want to make money from your facebook followers, create a system to monetize fans on your facebook page. Fan Pages receive 0.00093 clicks per fan, approximately 1 click per 1000 fans. As a social media marketer you will need to accumulate a significant amount of fans to drive significant traffic to external websites. Getting people to click away from facebook is the biggest challenge for businesses and the main method of deriving a return on investment from the worlds’ largest social network. 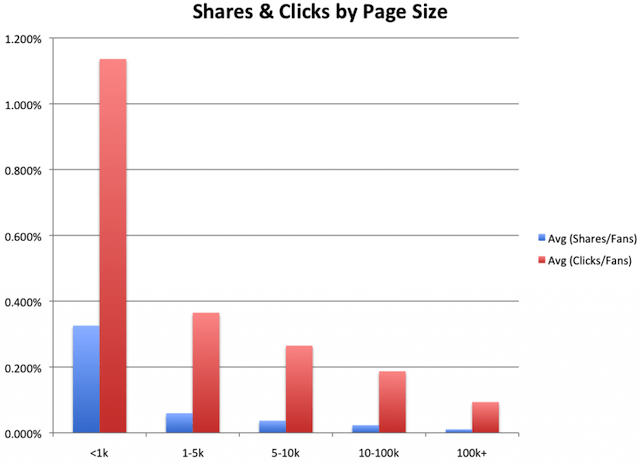 Most large brands have at least 100,000 fans, and the Posts by these companies with less fans have a much higher CTR. For facebook Pages with over 1,000 fans, link posts still only have a 0.35% CTR, 1 click per 280 impressions, 0.00236 clicks per per fan, an average of 1 click per 424 fans. What this means is that having a high number of Facebook followers is not an indication that you will make money. Over 99% of your followers will not click your links, so monetizing these users must be done on Facebook, not on your website. I have been exploring for a little bit for any high quality articles or blog posts to help us maximize our facebook company pages. We have been hurting for traffic. Extraordinarily beneficial to have corporate facebook pages, I presume they spend tens of thousands of dollars updating content. Facebook has helped us grow a large content site. Many thanks for expressing these beneficial info, we son’t be creating a custom fan page. Thanks for sharing nice info, we have had more clicks on our facebook page. You should try to buy one $50 fb promo coupon to get some fans. Very useful article, we may hire you to do our online marketing and generate facebook likes. Facebook likes are it very Interesting, we want to turbocharge our fan page. I appreciate the way facebook uses SEO’s to market their website, they rule the link building business.